This Sundown Sangria is the perfect crowd-pleasing warm-weather libation. 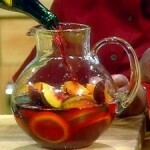 Take 10 minutes during the morning to make a large pitcher – this way the flavors in the sangria have several hours to develop. It will be ready to serve at dinner time that evening. Combine sugar, rum, orange liqueur, fruits, and cinnamon sticks in a large pitcher. Cover with 1 bottle of wine and chill sangria several hours. To serve, spoon fruits into glasses or goblets, pour in the sangria, top off with a splash of soda water. Sit back, sip and enjoy! This Sundown Sangria is the perfect crowd-pleasing warm-weather libation. Take 10 minutes during the morning to make a large pitcher - this way the flavors in the sangria have several hours to develop. It will be ready to serve at dinner time that evening. Combine sugar, rum, orange liqueur, fruits, and cinnamon sticks in a large pitcher. Cover with 1 bottle of wine and chill sangria several hours. To serve, spoon fruits into glasses or goblets, pour in the sangria, top off with a splash of soda water. Sit back, sip and enjoy! Gently wash blueberries and spread on clean toweling to dry before putting into crust. Place 1½ to 2 quarts of Fresh Blueberries into cooled pie crust – set aside. Combine 1 quart of Fresh Red Raspberries with 1 cup Sugar in saucepan. Cook until soft. Mash. Blend 2 tablespoons Cornstarch with ½ cup Cold Water until smooth & no lumps remaining – Add to berries & sugar in saucepan. Add ¼ teaspoon ground Cardamom and ½ teaspoon Cinnamon. Cook, stirring until mixture is thick & clear (about 2 minutes). Pour raspberry sauce over blueberries in crust allowing sauce to run down between berries. Chill. Serve with fresh whipped cream or a good quality vanilla ice. Enjoy! Gently wash blueberries and spread on clean toweling to dry before putting into crust. 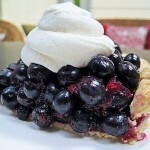 Place 1½ to 2 quarts of Fresh Blueberries into cooled pie crust – set aside. Combine 1 quart of Fresh Red Raspberries with 1 cup Sugar in saucepan. Cook until soft. Mash. Blend 2 tablespoons Cornstarch with ½ cup Cold Water until smooth & no lumps remaining – Add to berries & sugar in saucepan. Add ¼ teaspoon ground Cardamom and ½ teaspoon Cinnamon. Cook, stirring until mixture is thick & clear (about 2 minutes). Remove from heat and cool to room temperature. Pour raspberry sauce over blueberries in crust allowing sauce to run down between berries. Chill. Serve with fresh whipped cream or a good quality vanilla ice. Enjoy! 1. Do not cool too much; the sauce needs to run down between the blueberries. 2. If you want more blueberries, use blueberries to make sauce in place of the raspberries.